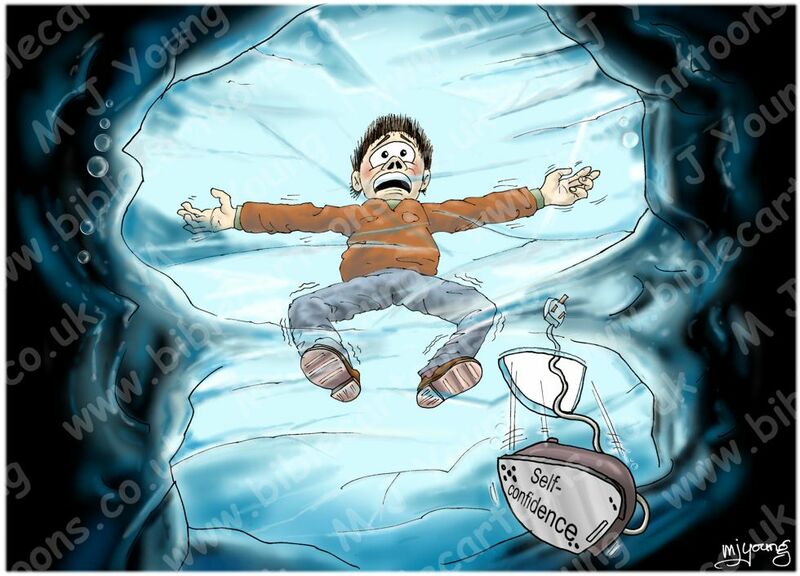 Bible Cartoons: Danger - Thin ice! It is so easy (as a Christian) to think that you are invulnerable to a particular sin, or a particular lie of the enemy (Satan). The longer I live the more I realise just how vulnerable I am. I liken it to walking on very thin ice; at any moment I might fall through. We can be so blasé about the things we face. It is so easy to become conceited; believing that our characters are developed enough; strong enough, to be able to cope with a given situation or sinful threat. We can ignore the danger signs that warn us of impending danger. We can fail to remember how we felt the last time we did wrong in exactly the same place in our life. Definition of the word “blasé”: uninterested because of frequent exposure or indulgence. Versed in the ways of the world. The first definition of the word “blasé” is interesting: “uninterested because of frequent exposure or indulgence.” That implies that the more we indulge a thing, the less effect we think it has on us. That can be true for sin too: the more we do it, the less we think it affects us, although that is not the case. Even if we fail to see the sin-stain on our souls, it is still there. When you think about that 2nd definition (from a Christian perspective) the WORST thing we could be would be “Versed in the ways of the world”! 12 Don’t be so naive and self-confident. You’re not exempt. You could fall flat on your face as easily as anyone else. Forget about self-confidence; it’s useless. Cultivate God-confidence. How true that is of us, & remember that I (& MUCH more importantly God, through this Bible verse!) am talking about us Christians here! We can suffer from self-confidence just as easily & blindly as non-Christians! That really states the case – It is entirely possible for us to fall over (sin) really badly, & repeatedly, if we are not careful. As with every other aspect of the Christians life (why am I surprised by this discovery!) we CAN NOT go it alone. We NEED the Lord God to keep us safe from “the sin that so easily entangles” *1. As soon as we think “OK, I’ve got that message” & we believe we understand about a particular sinful action, & we believe that we’ve got it under control – watch out! It’s not that sin is some living thing that can break through our defences, it is that we are susceptible to trying to walk free of sin without God’s help – that’s the problem: we can’t do it alone, even though we KEEP trying to! We think that is what is meant by “Christian maturity” – that we must learn & then go it alone, without reference to God. That is NOT “Christian maturity”, that is arrogance. When we try to achieve sinless perfection without reference to God & calling upon His help & full support – wham! We fall through the ice! I don’t want to overstate the thinness of the ice in my metaphor! I believe that the Lord God is able to support us, so that we do not fall through even the thinnest ice. We could walk on paper-thin ice, WITH GOD’S HELP. We can achieve the impossible – the Bible tells us that. But the problem always starts when we try to do stuff on our own. That’s the problem with self-confidence, as the Message Bible verse above shows us: self-confidence ALWAYS thins the ice we are standing on! So self-confidence is like a hot iron on ice – it quickly melts it! You can see that in my illustration. Verse 2 …We are those who have died to sin; how can we live in it any longer? Verse 6 … we should no longer be slaves to sin— 7 because anyone who has died has been set free from sin. Verse 11 In the same way, count yourselves dead to sin but alive to God in Christ Jesus. 12 Therefore do not let sin reign in your mortal body so that you obey its evil desires. Verse 14 For sin shall no longer be your master, because you are not under the law, but under grace. It is not that we are free of sin because of our own efforts – hopefully by now we know they don’t work! We are free from sin because of the work of Jesus on the cross. It is Jesus who secures our freedom from sin. As Romans 6 explains, when we die (& we have, through association with Jesus) we are set free from sin’s grip. We CAN still be involved in sinful activity, even as Christians, but we are also able to walk free from sin, which is not possible for a non-Christian. Once an unbeliever becomes a Christian, then they are able to walk free from sin too. Although we (Christians) may still sin occasionally, it is not our “default” position any longer. Our “old man” flesh can still cause us to sin. But now we have the CHOICE of whether to indulge our sin or not. And it is better not too! Such a choice is only possible by the grace of God. But such a choice (not to indulge our sin) also honours God, which is really what we are all about now. When we focus our attention on pleasing God, we will not want to indulge any sinful activity. So we need to keep our spiritual eyes on Jesus. That keeps us safe from harm.